Megasys offers the full line of Expand products. Expand offers high-quality, user-friendly display systems for all types of applications. From simple banner stands to complete display systems Expand has something for all your presentation needs. Martin Yale products are found in offices worldwide providing solid performance in every operation. Whether you need office products that will organize your unruly desk or a folding machine that can fold stacks of paper in minutes, Martin Yale has you covered. We carry the full line of Martin Yale products which include folders, tabber/labelers, shredders, paper cutters and much more. For a full listing of products please contact us or see www.MartinYale.com. We carry a wide range of new, used and rebuilt printer/plotters. Plotters from 24" to 60" in black & white or color units, even scanner combination units, be sure we have what you are looking for. Our rebuilt/used machines are cleaned, oiled, and adjusted for like new operation and they even come with a one year on site warranty. Even your first roll of paper is included. We carry all the inks, printheads and even the paper in a wide range of types and can perform all future maintenance and repairs. The GBC Office Products Group is the premier provider of visual communication tools, presentation products, document protection and paper shredding. We are committed to providing superior quality, innovation, and value, to help make the workplace-at the office, at school, or at home- as productive as possible. 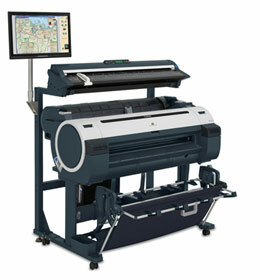 From 24" to 54", in Color or B/W, Contex has a scanning solution. Scanning photographic images to blueprints and line drawings, ask us how you can add scanning to your workflow. Stock is constantly changing please contact us for current availability. Kyocera Mita is improving the document management processes of customers and making people's jobs easier through a high-performance, end-to-end digital imaging product line that delivers one of the industry's lowest total costs of ownership (TCO). We service & sell all machines listed on this page, and carry supplies for them.